Ingvild Clark’s ‘The Hounds of Tindalos’ is a painting inspired by the a fictional creatures created by Frank Belknap Long’s horror fiction of the same name. These ‘Hounds’ inhabit the angles of time, while other beings (such as humankind and all common life) descend from curves. Due to their relationship with the angles of time, they can materialize through any corner if it is fairly sharp—120° or less. It is said that heir appearance is unknown, because no individuals who meet them survive long enough to give a conclusive description. With ‘The Hounds of Tindalos’ Ingvild Clark creates a painting confronting the viewer with abject, violent forms of obsessive ideas and thought that continually preoccupies or intrudes on a person’s mind. 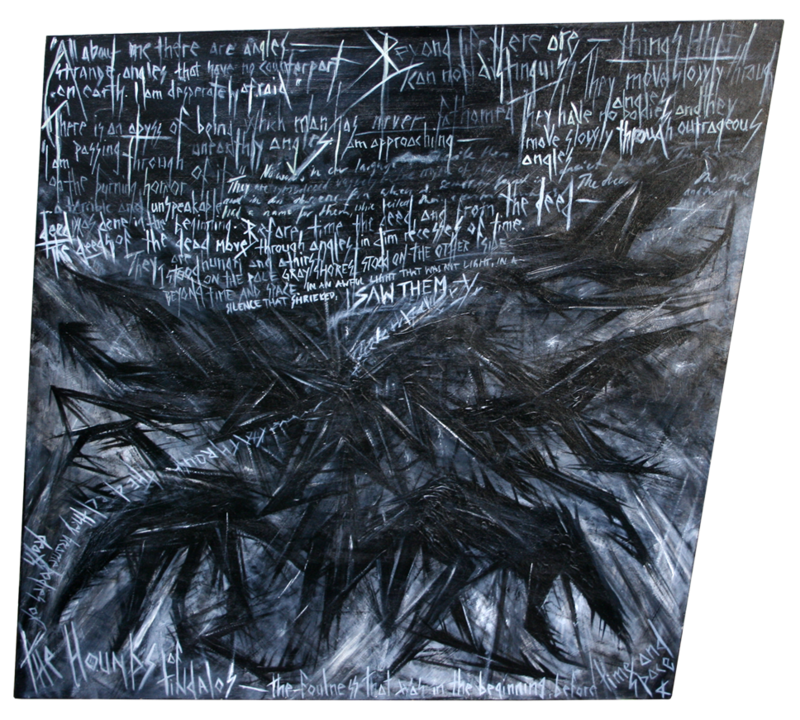 A recurrent theme in Clarks work is dread combined with sanity’s fragility and vulnerability. See also: ‘The Command To Look’ (2014) by Ingvild Clark.